Easy to fit box was tight at first but soon bedded in. Does what it's supposed too. The main issue I have is that for the money this should come as part of the top box not as a separate item. It is also very fiddly to fit the forward two bolts and screws. Having just acquired a 2017 Triumph Explorer XRT I was looking for a GIVI plate and top box to compliment the OEM expedition panniers. Sportsbikeshop had both products at prices that were well below that of other retailers. The GIVI Monokey adaptor plate arrived promptly and well packaged. Fitted in minutes and looks brilliant. Superb service by SBS as always. Good service... kept me informed. Product usual great quality, easy to fit. Replaced my OEM ( plastic) plate on my 2017 Explorer. Really easy swap and feels quality rather than cheap like the original..Also excellent service from SBS too..well done guys. Good strong base plate, good quality product. Although I've not bought the top box as yet, the ease of fitting and quality of the rack itself is an indication of the quality of the Givi range. Yes a little expensive but the quality is clear. Great service from Sportsbikeshop too. I bought this after previously owning an AltRider plate with Givi adaptors. They are worlds apart in terms of quality. 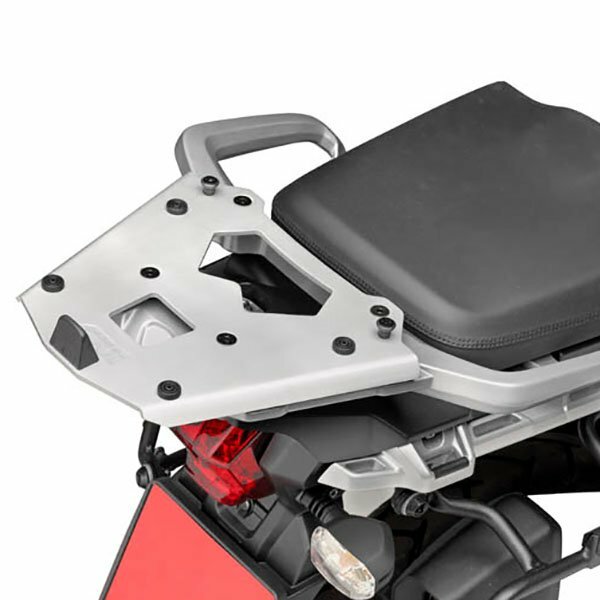 No shims required and the plate has rubber bungs fitted to the plate, not bungs supplied you fit to the underneath of the top box. Makes all the difference. Top product, top quality and looks great too. As for SBS....typical superb service and delivery that we have now come to expect but is often overlooked. Top job guys! Finely finished, fitted perfectly and very easily on my Triumph Explorer. Topbox feels very secure. Great service from SBS as usual. I got this for my 2016 XCA. Great fit, great service from SBS. I bought this plate to go on my Triumph Explorer, and it looks great. A really well made quality product. Great delivery from Sportsbikeshop. Solid and sturdy, very well made item. Looks great with top box off too. If you want piece of mind, buy Givi. Sportsbikeshop offered excellent service as usual. Great quality, unfinished plate with no paint to corrode. Easily fitted and flush, only criticism a bit pricey. Also good and quick service from SBS. Delivered the next day, great item, well done Sportsbikeshop. Excellent product, easy to fit. First class service from SBS as usual. This component is well made and easy to fit and does not lift the Topbox too high. Great product, delay in delivery not due to SBS at all. Was kept up to date at all times. Would recommend SBS, great service and a pleasure to deal with.